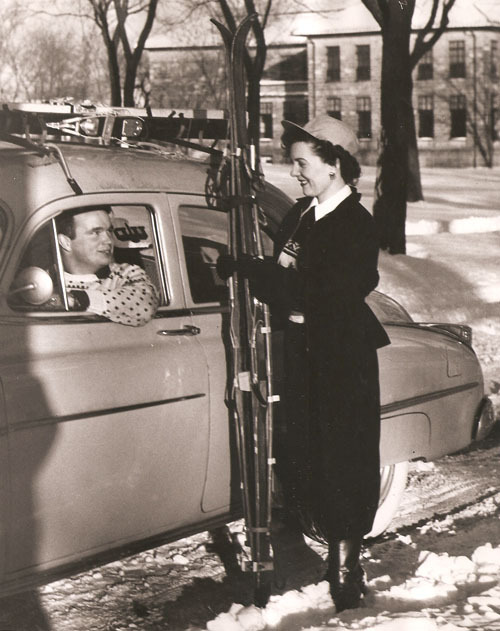 According to the Varsity News, the UD Ski Club was first formed in October 1951. 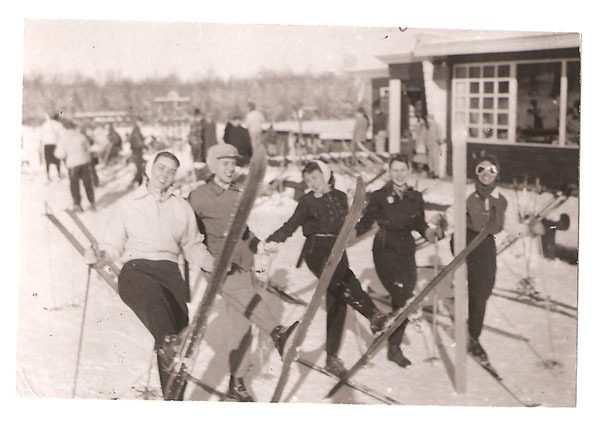 The skiing was done at Cadillac, Michigan, Pontiac Ski Club, Snow Valley at Boyne Mountain, Caberfae and West Branch. They even had an occasion to travel outside of Michigan to Aspen, Colorado, Blue Mountain Ski Resort near Collingwood, Ontario for a four day ski trip and Mount Tremblant located in the Laurentian Mountain range, Quebec, Canada. All students regardless of experience could join the club. Some of the more experienced skiers would participate in the Michigan Collegiate races against Michigan Tech, U. of M., Wayne State and Michigan State. In spite of its name, the Ski Club had other activities other than skiing, they also had indoor activities like square dances. During the warmer months, their activities included swimming, water skiing, hiking, and mountain climbing. The Ski Club also sponsored a “reliability run” which is done with automobiles-not skis. This is a contest in which the participants in each car try to follow an established course by solving a series of clues. To prevent racing, an average speed will be announced and participants would be checked periodically along the route with score points being deducted for being over or under that speed. Participants in the runs were expected to bring flashlights, dictionaries, almanacs and a sense of humor. It was a very popular club with as many as one hundred members taking part in its activities. But alas, it seems much like the Riding Club, membership must have dwindled down from a hundred to about a dozen die-hard ski fans. The last group picture I can find is in the 1973 yearbook. The Ski Club would have had plenty of places to ski this year-except I wish it wasn’t in front of my house! 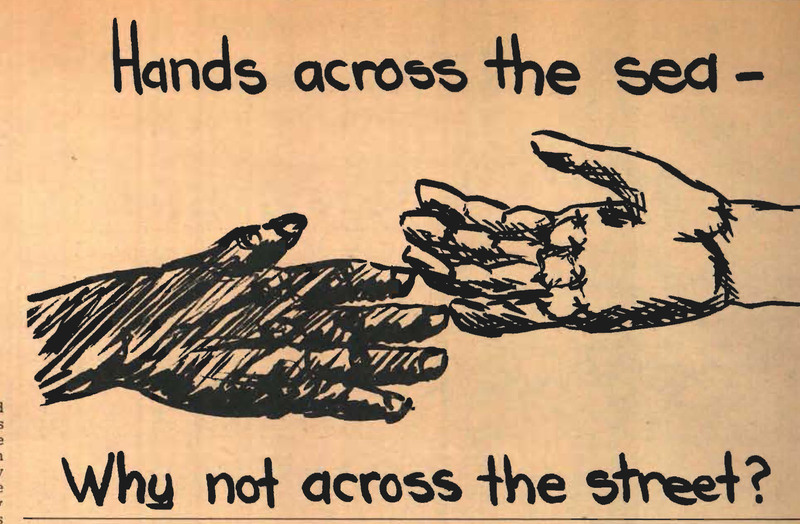 A couple of items that were published in the student newspapers (Varsity News and Outer Echoes) on the death of Martin Luther King, Jr. Every year in honor of Martin Luther King, Jr. students at the University of Detroit Mercy do some community service such as cleaning projects on campus and other service centers. Dudley Randall, poet, publisher, editor and also a librarian at the University of Detroit (1969-1975) where he was also the poet-in-residence, was born on January 14, 1914. 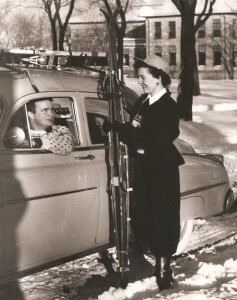 He worked at a foundry, Ford Motor Company and in the post office and saw military service during World War II. He earned degrees in English (1949) and Library Science (1951). Throughout his life and his many travels to such place as as the Soviet Union and Africa, he found inspiration for his poems. 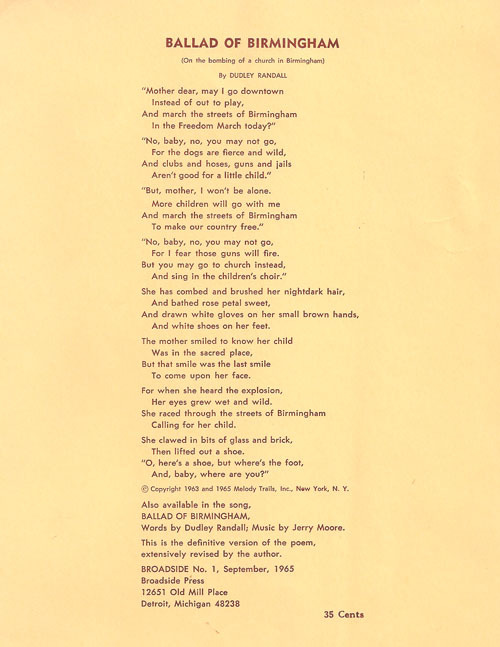 His career as a publisher started as a means to protect his rights to his poem “Ballad of Birmingham”, which was written in response to the 1963 bombing of a church in which four girls were killed. It was set to music and sung by a folksinger. To protect his rights he published it on a single sheet or broadside, thus the name of his publishing company:The Broadside Press. As an independent press he gave voice to some unpublished poets and national figures such as Nikki Giovanni, Sonia Sanchez, LeRoi Jones, Alice Walker and Haki Madhubuti. Gwendolyn Brooks left Harper and Row to become a Broadside poet. 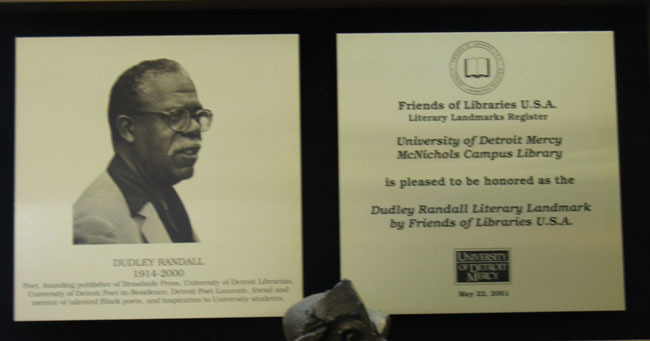 In recognition for his contribution to the development of American Black literature, the Friends of Libraries USA, designated the McNichols Campus Library as the Dudley Randall Literary Landmark in 2001. The first Literary Landmark designated in Michigan has the official plaque located in the Bargman Room, the second floor of the McNichols Campus Library. Dudley Randall died on August 5, 2000 at the age of 86. His spirit continues through the Dudley Randall Student Poetry competition and the Dudley Randall Center for Print Culture which sponsors poetry and dramatic readings and SIC, a UDM student publication of works by creative writing students. 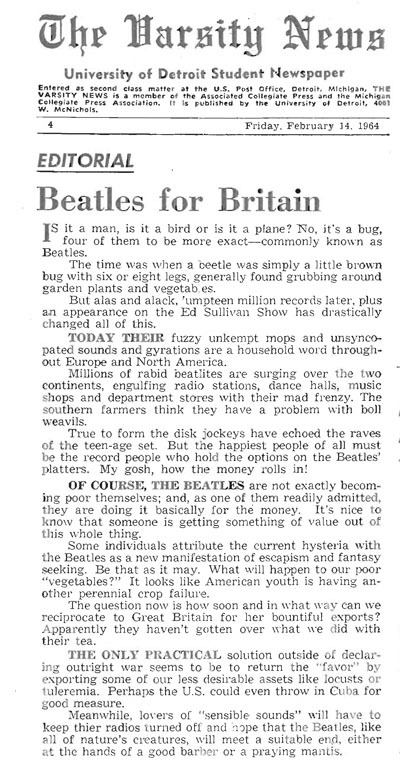 By 1964 the “fuzzy unkempt mops and unsyncopated sounds and gyrations” of The Beatles had invaded the United States. Judging by the Varsity News Editorial, not everyone thought they were going to be the standard that future bands would be measured against. With the likes of Miley Cyrus twerking across the video screen, the Beatles look pretty boring now. 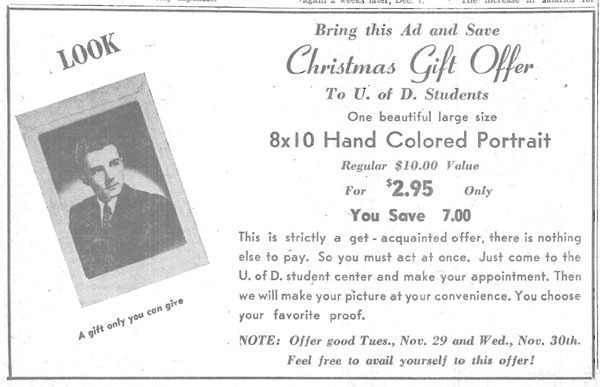 The beginning of 1922 started out with grand plans for the new location for the University of Detroit on Livernois, 42 acres which was recently purchased under the presidency of Reverend John P. McNichols, S.J. One of the first buildings built was the stadium, which was expected to seat 75,000, but was later scaled back to seat 20,000. 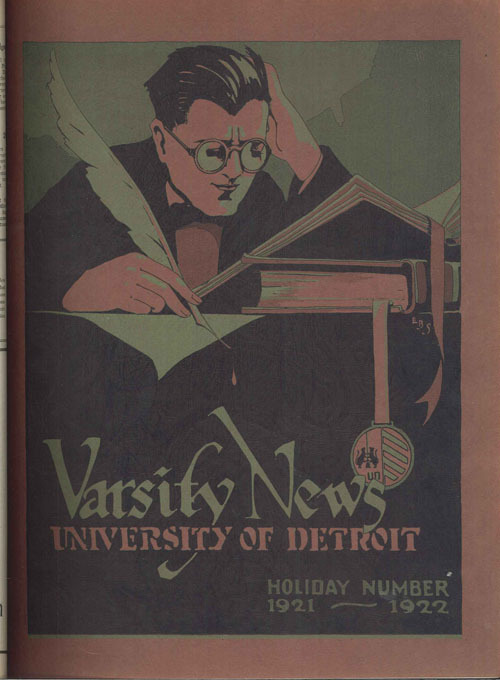 Oh well, a new year, a new location and high hopes for the future of the University of Detroit. 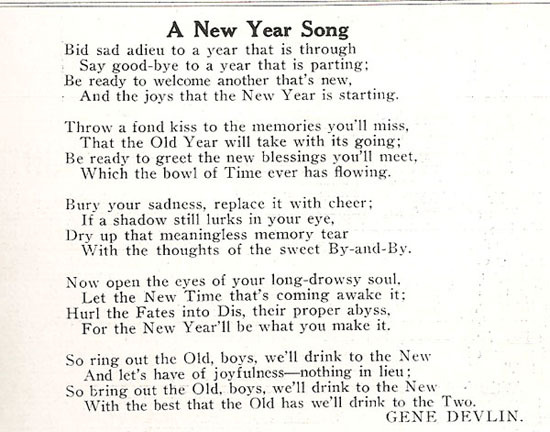 In the 1921-1922 Varsity News Holiday Edition there was the poem “A New Year Song” by Gene Devlin, a student at the university. The last line of the poem would have been appropriate if I had been doing this blog in 2000 or 2002. 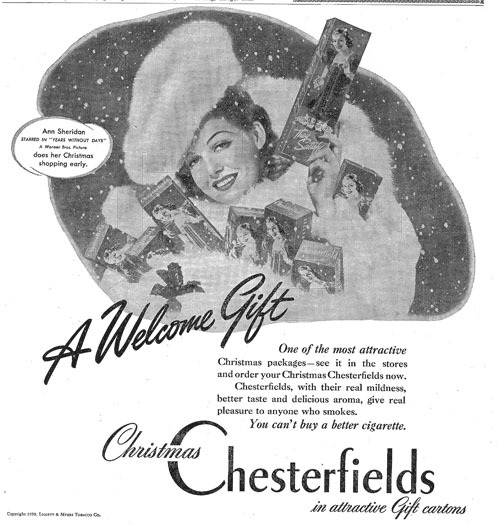 As kind of a follow up from an earlier blog on Christmas advertisements-here are a few Christmas ads for cigarettes. 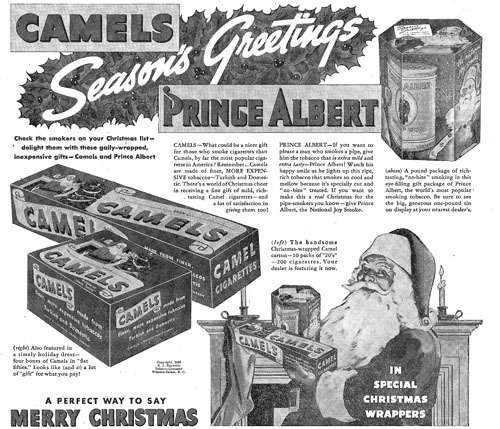 Think about it-when was the last time you saw an ad for cigarettes at all? 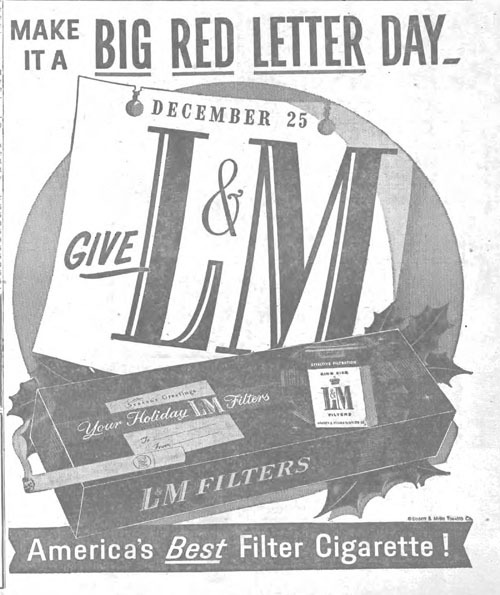 The last time there were ads for cigarettes in the Varsity News was back in 1963. A Riding Club was officially recognized by the Student Council in November 1963 (Varsity News Dec. 3, 1963). It started out strong with 52 members. 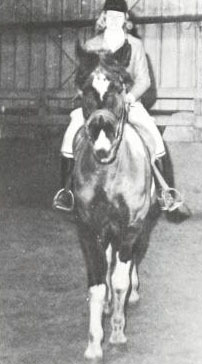 The Klentner Riding Academy (KRA) in West Bloomfield Hills was the club’s riding site. 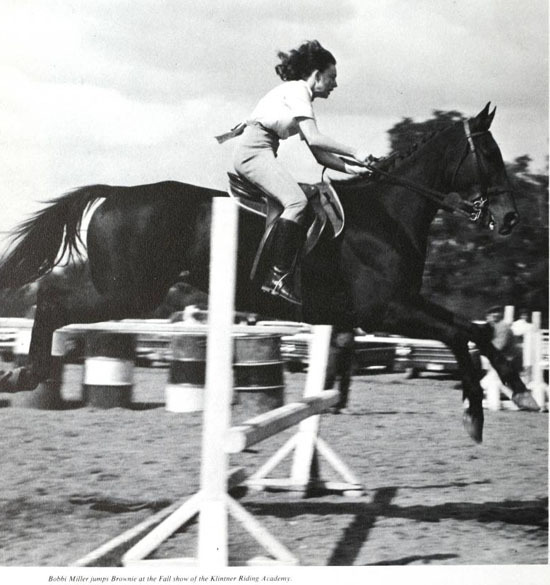 Initially there were five weekly riding classes (by 1965 it must have gone down to only once a week) for beginners to the more experienced riders. Lessons cost members $2. Some of the members had their own horses! The purpose of the club was to offer riding instructions to members and encourage the sport of horseback riding. Membership was open to all students and transportation to KRA was furnished to and from UD campus. As part of the club activities, they sponsored their own horse show at the Klentner’s Riding Academy and participated in the Grosse Pointe Horse Show and the traditional fox hunts. Social activities included, trail rides, sleigh rides and hay rides. The Riding Club would provide a horse drawn carriage for their Queen candidate in the Homecoming Parade (1965) and on Orphan’s Day, each member would pay for a child from the St. Francis Home for the Boys to go riding. At some point it looks like there was a drastic drop in club membership. The 1970 Tower Yearbook show only four members in the group picture for the Riding Club. 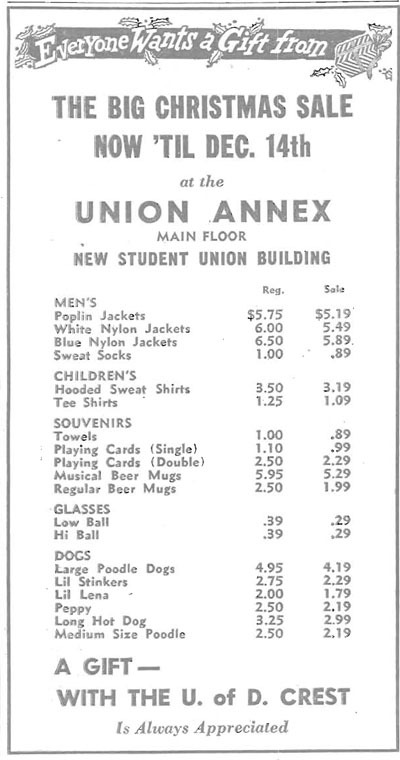 There is no mention of the club activities in the Varsity News browsing through the 1969-1970 school year. Did the students that had the most interest graduate? Did the expense for lessons get too expensive for the student’s budget? 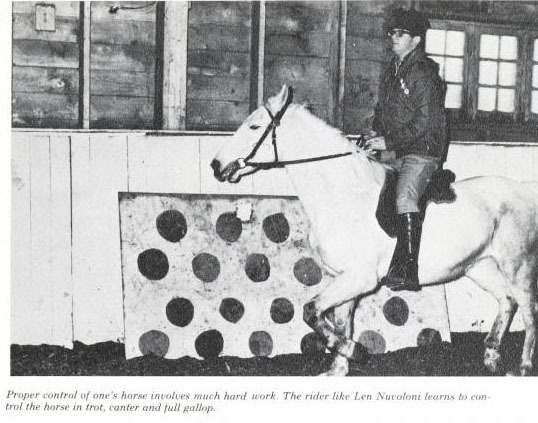 A Google search for the Klentner Riding Academy came up empty except for one reference in our own Folklore database. So did the lack of a place to take lessons on horseback riding end the club? Is there a UD alumni of the Riding Club who could say for sure what happened? How does such a popular club that starts out with fifty members shrink down to four in less than seven years? Just looking for some “horse sense” on the demise of the Riding Club. 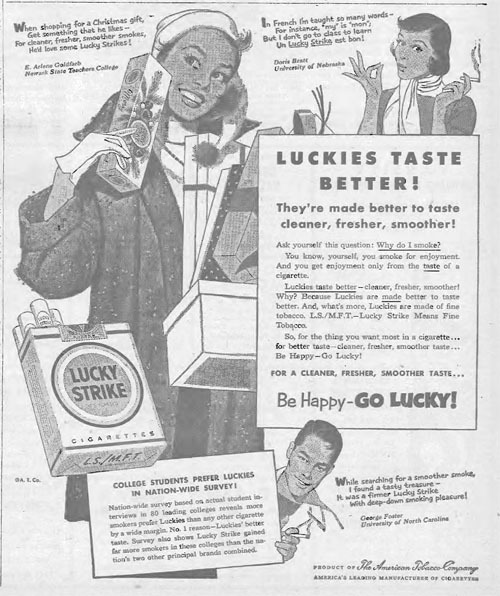 As people head out to the malls for their Black Friday deals, here are a few ads from the Varsity News from 1949 to 1960 that I found interesting. Anyone still have a “Musical Beer Mug” with a UD crest? 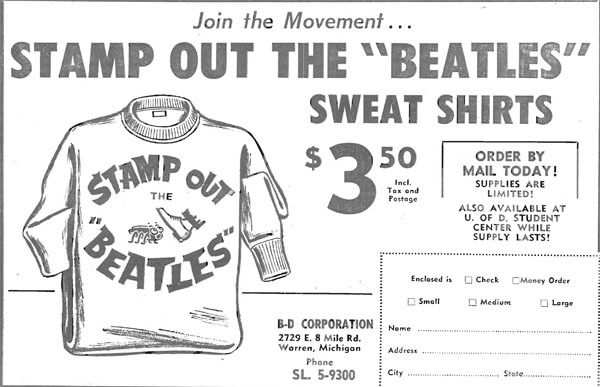 I would love to have one for the archives! 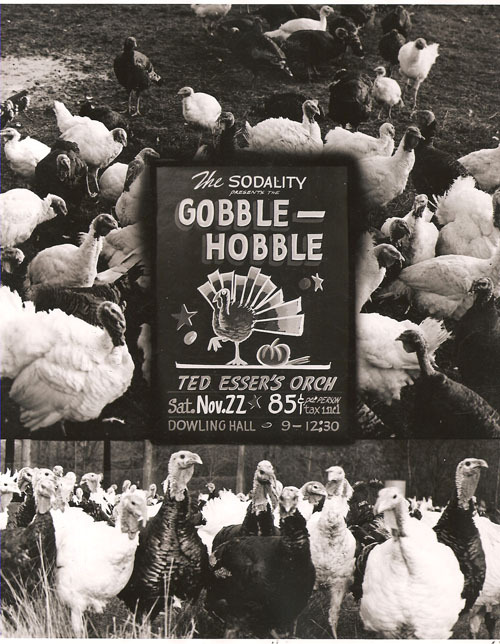 According to the Varsity News, the 1947 Gobble-Hobble ended a 16 year “No Dance” record at Dowling Hall. The dance sponsored by Sodality, was held in the Dowling Hall gymnasium. The ceiling was covered in balloons that would send down beams of colored light on the dancers below. Ted Esser’s Orchestra would provide the music.